It is pretty common knowledge that shader mods typically improve the lighting and shadows and just the overall appearance of Minecraft. However, most shader mods just stop there and don’t do much else to actually help the look of the game to be better, they just change one or two things and call it good. While this might be okay for the super casual gamer who gets on maybe once every few months, for those of us who play way too much for our own good, we want a mod that does more than that. Well, we’ve found the MrMeep_x3’s Shaders Mod that does a lot more than just change the lighting of Minecraft. While it does brighten the game up and make it easier to look at, changes the colors that actually make up the lights, and add in more realistic lighting, shadows, and other features, this mod is more than that. To put it plainly, it has a lot more to it than what’s on the surface. Unlike other shaders, it actually still looks good with traditional Minecraft instead of taking things way too far and making it look like a child scribbled color all over the game. 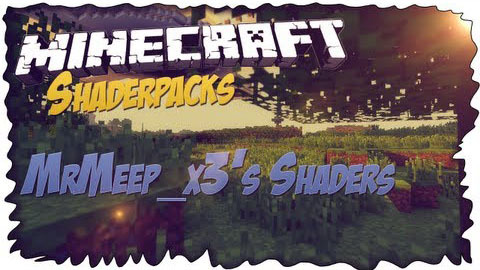 MrMeep_x3’s Shaders Mod 1.11.2 also works well with quite a few resource packs, so you won’t be limited to just one or two. You have the freedom to customize things how you want them to be, instead of having a shader have the final say about everything. As the player, this mod puts the controller back in your hands. This alone makes it unique among shader packs. With this mod, you’ll gain a lot more colors to the actual shading of Minecraft. With yellows, oranges, reds, and other new colors, you’ll see a depth you’ve never seen before. Be careful though, because with these new colors and effects, if you install the MrMeep_x3’s Shaders Mod for Minecraft incorrectly, it can cause some glitching. It’s pretty easy not to screw up though, because you can easily find the directions to install it online. Also, it is a shader pack and not really a standalone mod. This means you should have the GLSL shader mod already to be able to run it well. Other than that, you shouldn’t really face many problems if your computer can normally run Minecraft without a problem. It is a really good mod though; you’ll appreciate the new layers added to a game you’ve loved for a while. The .zip file that you download is in proper shaderpack format. Simply copy the .zip file to your .minecraft/shaderpacks folder.